The MicroFest Amsterdam is a microtonal music festival in the capital of the Netherlands. 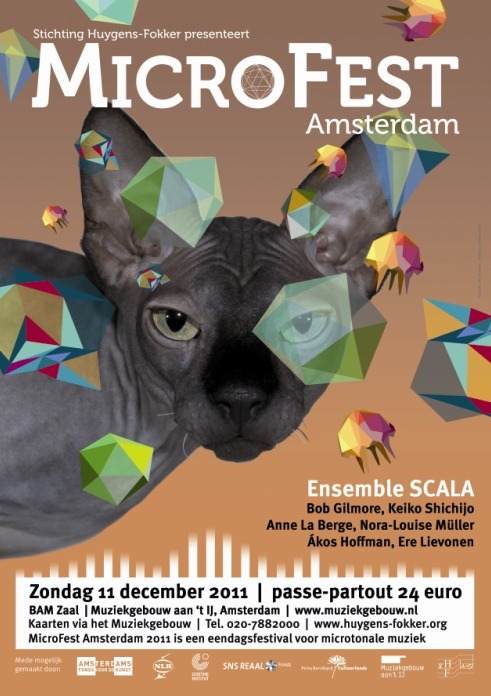 In December of this year the Huygens-Fokker Foundation organizes the first microtonal festival in The Netherlands, under the title MicroFest Amsterdam 2011. The foundation will thus follow into the footsteps of the Los Angeles-based MicroFest and the UK MicroFest in London. Through a versatile program of the most diverse forms of microtonality many enthusiastic listeners and interested in unconventional tunings and microtonal music will be served. Music that, like the famous American composer Charles Ives put it, consists of ‘the tones between the keys of the piano’. Thus, the festival wil give attention to 31-tone music, 19-tone music, quarter-tone music, 96-tone music, music in Bohlen-Pierce tuning, music in meantone temperament and music based on just intonation. These devisions or tunings are leading to completely new musical and tonal possibilities, a source of fresh sounds that forever expands the ear of the listener and the thinking about music. standard repertoire works and new compositions for the Carrillo-piano. which allows her to play microtones more easy. which the Fokker-orgel is controlled entirely by a laptop computer. are many new works composed for, several of which this concert will sound. Hans Kox, Tarquinio Merula, Owen Bloomfield and Ivan Wyschnegradsky. Tickets can be reserved at the Muziekgebouw. The tickets include a drink after the concert at the restaurant Zouthaven from the Muziekgebouw aan 't IJ. This festival is made possible by the support of: the Amsterdam Fund for the Arts, National Aerospace Laboratory (NLR), the Goethe-Institut (Netherlands) and the Muziekgebouw aan 't IJ. The renovation of the Fokker organ was made possible by o.a. the Prins Bernhard Cultuurfonds and the SNS REAAL Fonds. A donation of the Nederlands Akoestisch Genootschap and a shared contribution of six reputable consultancy offices, namely Cauberg-Huygen, DGMR, LBP|SIGHT, M+P, Peutz and Wijnia-Noorman-Partners (WNP) made it possible for Huygens-Fokker to purchase the Carrillo-piano.